I saw this recipe on Facebook. The title was "Most Amazing Pork Chops Ever". When I read the title, I was enticed and had to try it. I couldn't remember who put the recipe on Facebook so I searched the internet and found the recipe came from The Crockin' Girls. With only five ingredients and a Crock Pot, I knew I was good. The ingredients are definitely higher in sodium so you may want to adjust according to your diet. I did use a few low sodium items. My picture isn't great. I should have taken a picture of the pork chops with the mashed potatoes and roasted green beans. This was quick and simple and a yummy comfort meal. Spray your slow cooker with cooking spray. Place pork chops in the bottom. 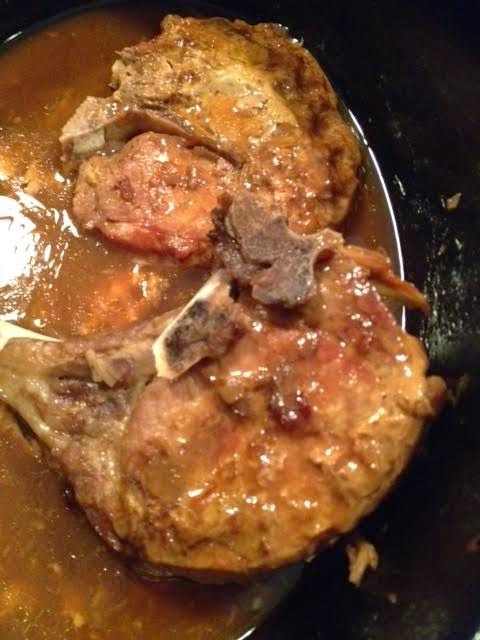 Mix the remaining four ingredients in a mixing bowl and pour over the pork chops. Cover and cook on low 6 - 8 hours. Serve with mashed potatoes!